Last week while I was at lunch, I came across this submission on Hacker News about how Avinash discussed the effectiveness of The Church of Jesus Christ of Latter-day Saints' SEO practices. As an SEO, I was naturally interested in their strategy, so I looked deeper. What I found was extremely interesting and a great case study of the power of SEO (and how to do it well). One of the valuable benefits of organic search marketing is targeting searchers who have not yet been exposed to your brand. Through targeting highly searched terms, a website can expose their messaging to new users. LDS does an incredible job at attracting traffic from a variety of non-branded religious and non-religious terms. 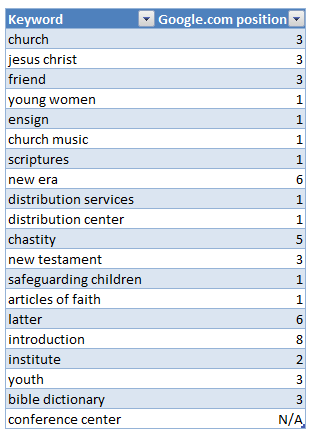 These are the top twenty non-branded terms sending traffic to the LDS website. Source: SEMRush tool on Raven tools, excluding mentions of LDS, Latter Day Saints, and Mormon(s). Ranking checked with SEO Book Toolbar. The LDS website is targeting a diverse set of religious terms such as Jesus Christ, church, church music, scripture, and new testament. They’re also targeting some interesting non-religious terms including friend, young women, chastity, and safeguarding children. When you look at these terms, and data on the value of a Google result position, it’s easy to see how the LDS church is effectively using SEO to attract new visitors to its church. If only companies were this effective. If you’re not accustom to SEO, I recommend taking a moment to read over SEOmoz’s Beginner’s Guide to SEO, but all you really need to know is that Google uses links between sites to evaluate relationships and the quality of content. When looking at links, Google evaluates factors like quantity, popularity, trust, and words used when linking (also known as anchor text). Let’s just say, LDS has a lot of links from lots of different sites. If you sort the Top 500 Most Important Sites on the Internet by External Links, LDS would sit right under MTV.com (3,508,016 links) in number of external links. That's a lot of links. Anchor text, or the words used when linking, are a significant ranking factor used by search engines to determine the words associated with a piece of content. Users often link with phrases such as brand terms, company name, and URLs. A website's rankings can be increased by increasing the number of inbound links with descriptive (keyword rich) anchor links. 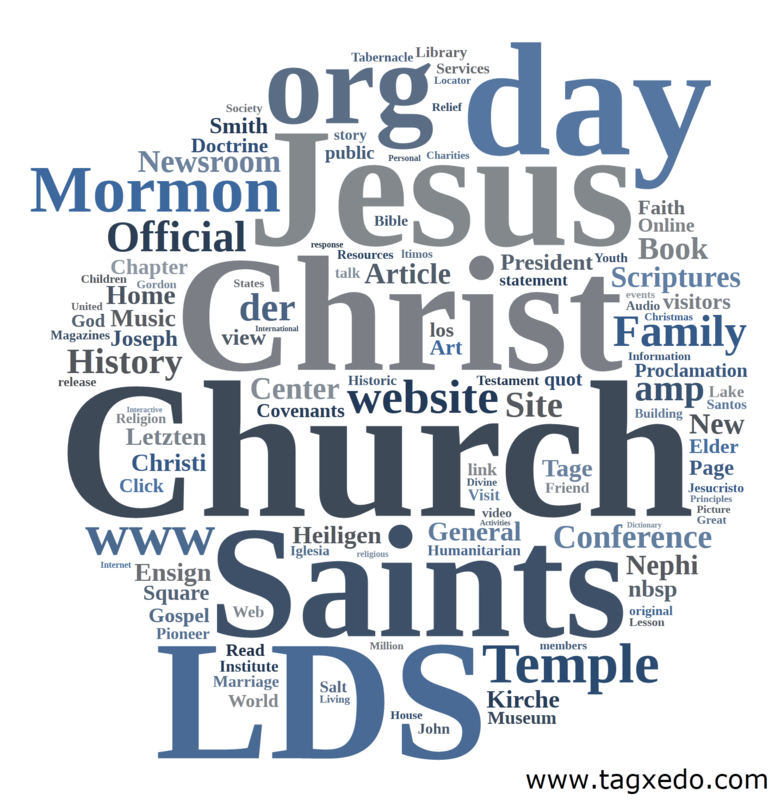 Below is a tag cloud of the anchor text of inbound links pointing at LDS.org. Source: Linkscape API and Tagxedo (excluding terms including < and http). 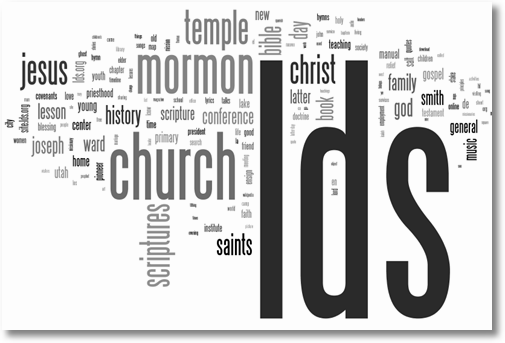 The keyword cloud visually demonstrates the distribution of keywords used when linking to LDS.org. This is an impressive link profile and doesn't come together on its own. 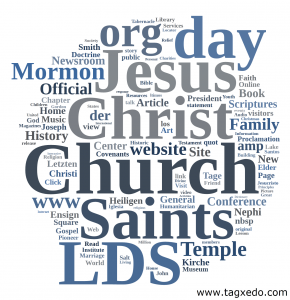 Over 100 unique domains link to LDS.org with the EXACT anchor text "church"
60 unique domains link to LDS.org with the EXACT anchor text "Jesus"
There are directory submissions anchored with "Jesus Christ"
They have a lot great links, so the next natural question was "what is attracting all these links." Nothing crazy here, just more solid SEO practices. A lot of diverse content, resources, and community content. So did LDS just get lucky, produce great content, and earn top rankings without an SEO strategy? They seem to have a very focused and consistent SEO strategy behind their website. A bit of searching brought me to this thread on the LDS website in March 2007, where a forum user asked if the church has invested in SEO. Larry Richman, the Director of Product Awareness at LDS, posted that they were looking at SEO and had a team working on it. By the end of 2007, it looks like LDS got around to link building. The graph above shows the number of links discovered each month. Between late 2007 and early 2008, the LDS.org link acquisition hit a steady rate. Spikes can be indicative of a large push, promotion, or major event. A steady graph can create a linear growth rate, which may be indicative of acquiring the same number of links each month. The LDS link profile has been fairly linear since early 2008 until 2010. According to a post on a wiki on LDS.org, their SEO team is currently targeting terms such as employment, debt management, and food storage with their website ProvidentLiving.org and are looking for assistance in link building. I'm impressed by how much LDS gets SEO and sets out to educate their webmasters. A blog that started as ldsWebguy.com (Larry Richman), which has now rebranded as LDSMediaTalk.com, does a great job at educating members of the church on the basics of SEO. By the end of 2007, LDS had written a blog post on How to Build Links to Your Website, a post that corresponds well with the upturn in link acquisition. They have also posted not once, but twice, on how to optimize links. I wrote this post because LDS impressed me with how they have leveraged inbound marketing to dramatically improve their outreach. Their strategy is much more forward thinking than many organizations and companies. They’re a great example of how to leverage SEO to grow awareness of your organization. They do seem to have some technical SEO issues they could improve upon, but they've been effective in their link building. Keep up with current marketing trends. Target a diverse set of non-branded relevant terms that will attract interested searchers. Target terms that will attract first time visitors. Links matter, and so does anchor text. Leverage your community, partners, and resources available. Educate your internal team and external colleagues on SEO best practices. Leverage your community to build links. Create great content that people can link to.